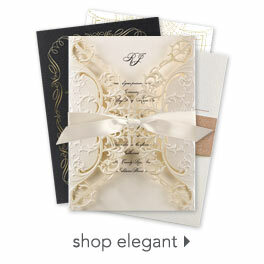 A gorgeous presentation of your wording, this ecru shimmer response card is laser cut with a vintage lace design. Your wording is printed in your choice of foil colors and fonts. Envelopes are included. Please note: a slight variation of color may occur on the back of the response card due to the unique, laser-cutting process.